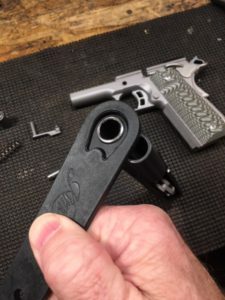 This article will show you step-by-step how to disassemble (Field Strip) and reassemble a Kimber Aegis Elite Custom 1911 Semi-Automatic Pistol in .45 ACP. 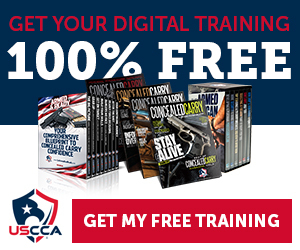 You will need to know how to field strip your pistol for cleaning purposes. 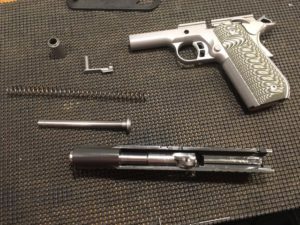 For just the Disassembly, see How to Disassemble a Kimber 1911. 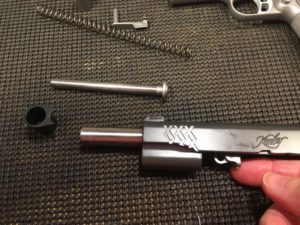 This procedure will work for most, if not all makes and models of 1911 pistols with a 5″ barrel. Some will be referred to as “Government” models. Different Manufacturers may use other names to signify a 5″ full size 1911. 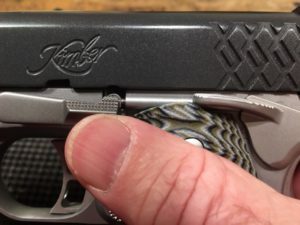 For example, Kimber refers to some of their 5″ models as “Custom”, such as Master Carry Custom. 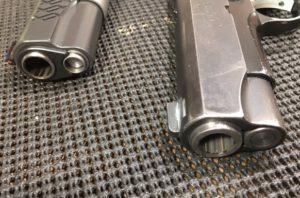 The Master Carry Pro will have their 4″ barrel, and the Master Carry Ultra will have a 3″ Barrel. 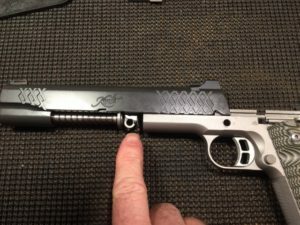 This procedure will not work for a Kimber model with a “bull barrel”. Most of the 4″ 1911 Models use a different design to lock the barrel to the slide. 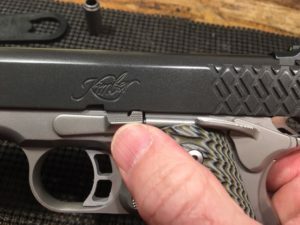 If you have the 4″ model, see my article Cleaning a Kimber 1911 Pro Carry. 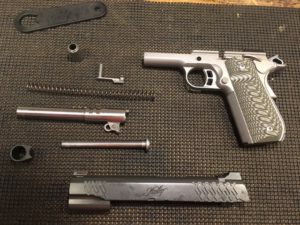 or Kimber Pro Carry II Disassembly. 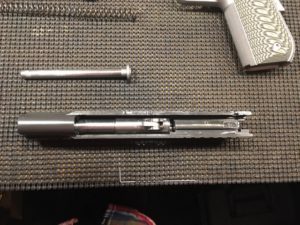 Field stripping is basically removing the slide from the frame, and the removing the recoil spring, guide rod and barrel. 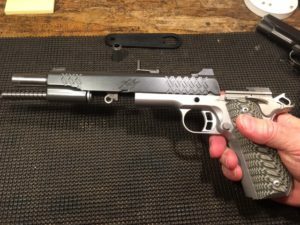 Once this is accomplished, these components can then be cleaned and lubed as outlined in my article: Cleaning a Kimber 1911. The cleaning procedure and products used will certainly work on any 1911, and most other guns as well. 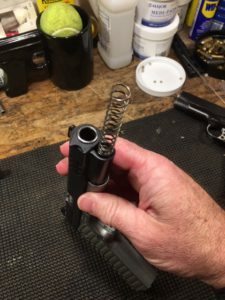 Just be aware that if you are going to clean a Glock, Springfield XD series or Smith & Wesson M & P firearm or other gun with “plastic” parts, be sure to use a cleaner designed for that use. 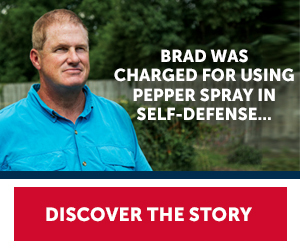 such as Birchwood Casey Gun Scrubber Synthetic Safe Cleaner. Some of the more common cleaners are harsh on plastics and polymers. If this is the first time you are doing this, do not fear! It is not hard if you follow the steps. The next time you do it you will be a pro and will not likely need these instructions. It looks like a lot of steps but I broke it down as far as I could to make it as clear and easy as possible. Repeat the last 2 steps. BE SURE THE GUN IS UNLOADED. Set the gun on a table or bench with the barrel facing up. Wear eye protection in case the recoil spring launches the plug into your face. 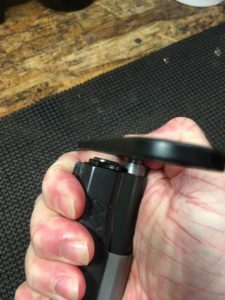 Line up the barrel bushing wrench with the bushing and apply downward pressure on the plug until you can turn the wrench. Turn the wrench clockwise to the 9 o’clock position. Carefully and slowly reduce pressure and allow plug to rise as tension is released from the recoil spring. Be careful or the spring will launch the plug across the room. I know this for a fact. 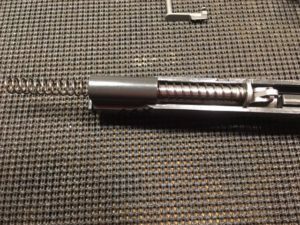 Once the recoil spring is loose, the slide will move easily. 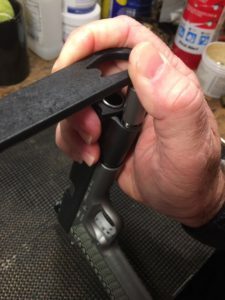 Line up the notch in the slide with the Slide lock lever as shown. Press on the slide Lock lever pin on the opposite side of the gun to start pushing it up enough to grab it. 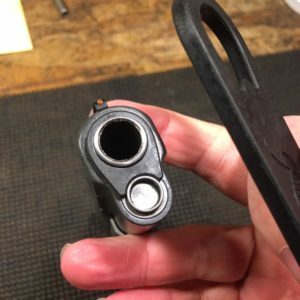 Remove the slide lock Lever and set it aside. Remove the slide by pulling it off the front of the frame. 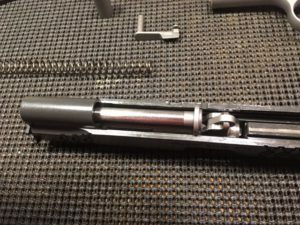 Remove the recoil spring from the slide assembly by pulling it out the front and remove the guide rod as well by pulling it up out the back. Use the barrel bushing wrench and turn the bushing counter-clockwise almost as far as it will go. There is a “key way” that needs to line up with the notch in the slide. Remove the barrel bushing by pulling it out the front. Use the barrel to help push it out if necessary. Remove barrel from the front of the slide. You likely will need to flip the barrel lug forward so it will fit. You have now field stripped your 1911. Now you can clean and lubricate each component. Place the slide upside down on your bench and slide the barrel into the slide. Line up the barrel bushing as shown and press it into place firmly against the front of the slide. Using the barrel bushing wrench, turn the bushing clockwise to the 9 o’clock position. 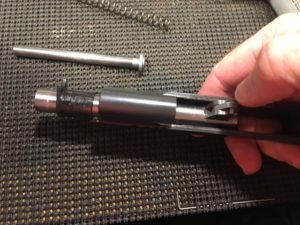 Lay the slide on the bench upside down and place the guide rod on top of the barrel as shown. 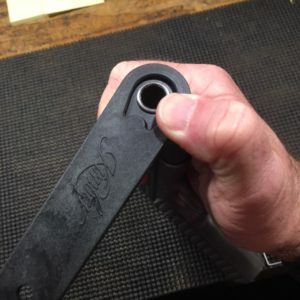 Slide the tighter, smaller end of the recoil spring onto the guide rod and seat it firmly. 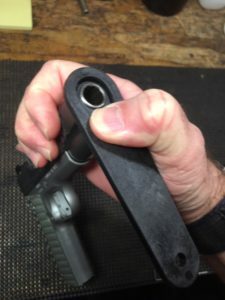 While holding the barrel and guide rod in place, turn the slide sideways as shown and be sure the barrel lug is perpendicular to the barrel. Slide the assembly onto the rails of the frame until the barrel lug is lined up with the hole in the frame. Insert the slide stop pin through the hole in the frame and line up the notch in the slide with the square hole in the frame as shown. Line up the slide stop lever with the hole. ** Be careful here. If you do not line things up as shown, you may scratch your gun when pressing the lever into place. Press the lever into place by applying even pressure to both ends of the lever. Once in place, move the slide all the way forward and lock it there with the safety lever. Place the gun on the bench facing up. Place the plug on the end of the recoil spring. 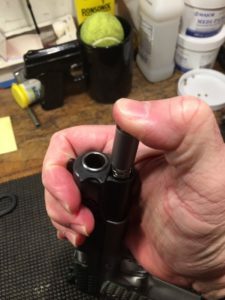 Line up the wrench with the barrel bushing and press down on the plug until the wrench is flush with the muzzle. Maintaining downward pressure, turn the wrench counter clockwise to the 6 o’clock position. Congratulations! 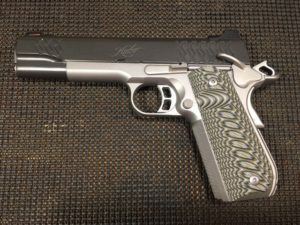 You’re done reassembling your 1911! Now work the slide back and forth with your support hand to make sure it feels right and to help the lubricant move into all the moving parts. Then wipe any excess lube off of the gun with a rag or paper towel. Now be sure to perform a 1911 function and safety check. You have successfully field stripped and reassembled your 1911. 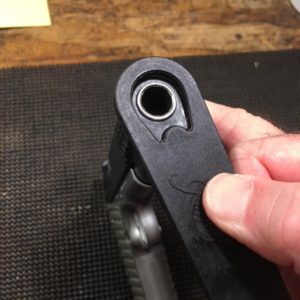 If your gun does not have a barrel bushing, please see Cleaning a Kimber 1911 Pro Carry for instructions on the disassembly on a Kimber with a bull barrel. 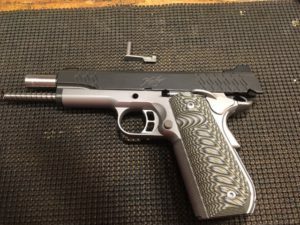 Hi, thanks for showing how to reassemble this nice looking Kimber 1911. When I watch you it doesn’t look that hard but there are still a lot of steps. 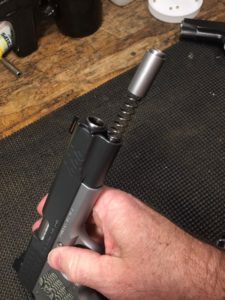 I think safety is important and cleaning and reassembling and cleaning one’s gun is an important part of the safety measures when handling guns. It’s great how smooth all the parts come together in this precision weapon. 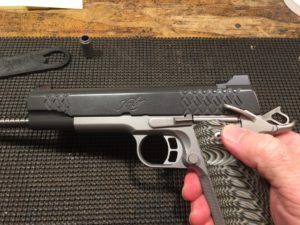 Stefan, thanks for checking out my article on field stripping a Kimber 1911! 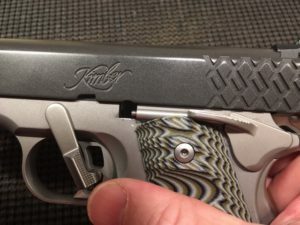 I am a big fan of Kimber as they do make a fine weapon. 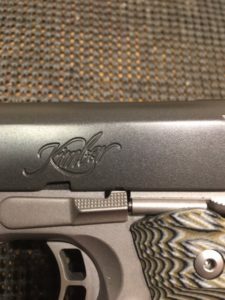 I have had a Kimber Pro Carry for years and it has been through a ton of training and been beat up a bit and still functions flawlessly! Stripping and reassembling has always been a hassle for me. But your post is quite explanatory enough but one question is how do I remove the recoil spring? I didn’t get that part well?! It took me months before I could even try stripping not to talk of reassembling a pistol. I get really scared. Thanks for this post. Salim, thanks for reading my post on Field Stripping a 1911! 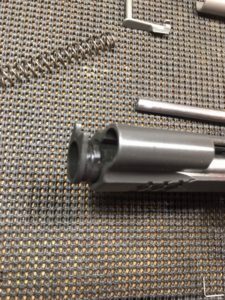 The recoil spring will just pull right off the guide rod either before of after you remove the slide from the frame. I will clarify that in the article. Thanks for pointing out that it is not clear! 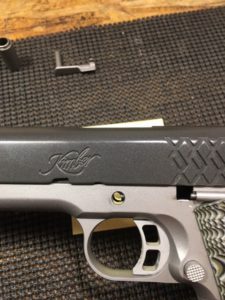 Thank you for this informative and step by step post about the Kimber 1911 assemblage. You really explained it in simple terms and and the images really compliment the points and procedure you mentioned above. I will surely share this post with those who will find it more helpful. Thank you. 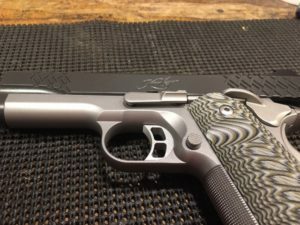 Clement, thanks for reading and sharing my Field Stripping a Kimber 1911 article! I was always intrigued by guns, I really love reading this, so informative and fun! You explained everything so thoroughly, even a dummy like me would understand with no problem. Thanks for this great article with amazing tips! I might buy one soon. Wish me luck! I am going to share this with my friends too, just in case. Isaac, thanks for commenting and sharing my post! I am glad you found it informative! I must say that this article is very helpful and informative. Some people say that it is pretty easy to reassemble a pistol, especially this one but I found it to be a little difficult for me. You helped me a lot and I will definitely bookmark you as I can’t wait to see more of your topics. Daniel, thanks for reading and leaving a comment on my Field stripping a 1911 article. 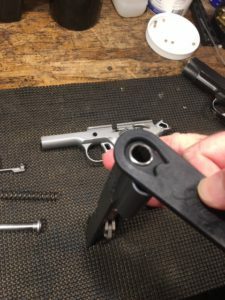 I was apprehensive the first time I had to disassemble my new 1911 for cleaning, afraid I would not get it back together correctly! However, I had a gun dealer show me how to do it and then I was fine. It is not nearly as hard as it looks once you do it yourself.